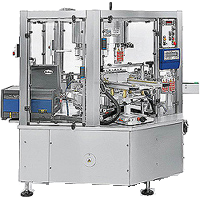 Enterprise supply hot melt wraparound labellers from 4,000 to 40,000 bottles per hour. Typical applications include PET bottles and food cans. Labels can be both paper and plastic which can be transparent. Some key features and benefits of the labelers we supply are reduction in glue usage giving cost savings and quick change over reducing down time. Typically hot melt glue labellers use heated glue rollers and hoses for the glue application. This has the disadvantage of requiring extra glue hoses which are costly to replace. Additionally the glue rollers can pick up dirt and paper etc from the bottles and return it to the glue tank causing blockages and in effective gluing. Furthermore the end user is more tied to buying the labeller manufacturers change parts. However we use self cleaning glue spray guns instead. These proprietary parts deliver tiny spirals of adhesive onto any size container with little or no stringing, offering a raw materials savings of up to 90 percent as compared to conventional wheel-pot applicators. By more accurately applying adhesive at any speed, the system also enables better process control and higher production efficiency, while significantly reducing maintenance costs and scrap rates. Moreover, it eliminates adhesive circulation and provides superior system insulation, offering more than 50 percent energy savings as compared to a typical wheel-pot labeling system. The fact they are from a proprietary specialist glue tank manufacture means reduced total cost of ownership and greater flexibility in procurement. 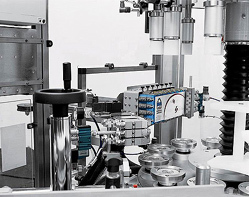 With regards to ease of change over each bottle diameters has a different platform rotation rate which has a direct relationship to the carousel speed as well. Platform rotation is achieved by a sprocket located underneath each bottle platform controlled by a toothed belt. This system is very easy to manage and has a much quicker change over than cam systems.. There are two ways on our machine to adjust this. If there are only a few different bottle diameters the individual bottle platform will have permanently fixed sprockets. Changer over is achieved by moving the belt down onto the correct sprocket. However if maximum flexibility is required along with operator change over then Enterprise have an alternative solution. The labellers can be fitted with an independently inverter controlled drive for the platform rotation only. This is adjusted for the different bottle diameters by a format selector switch on the panel. It also means that for new products the customers own engineers can add new formats without platform rotation parts by themselves. This means greater flexibility of the end user and also gives cost savings when additional formats are required. The HM labellers supplied by Enterprise offer real savings in glue costs, less downtime for glue contamination and quick change overs making for greater efficiency.